My thesis on alchemy as a deep language relies on the premise that the very act of shaping any aspect of the qi field, in any dimension/heaven, by human or non-human intelligence, is best understood as a spontaneous yet recognizable expression of language. The patterns of qi flow or "wave forms" vibrating between the continuum of shen (intelligence) and jing (matter) constitute the deep grammar of this universal language. This qi wave language is how the infinite field of spirit/intelligence talks to the finite bodies/particles formed by essence (jing). 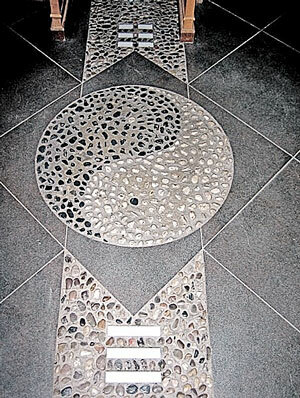 Dao floor mosaic in China. Earth symbol above, Heaven below, yin & yang flow in harmony. 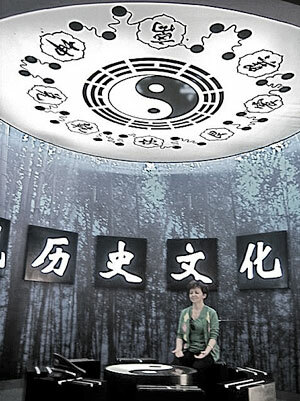 Meditating in Inner Alchemy museum, White Cloud Temple, Beijing. Qigong is the language process of using ritual body movement, breath, and mind intent to shape the qi in order to communicate mostly with the "horizontal" (as humans see it looking forward) or exterior manifest qi field of Earth. Nei dan deals more with the "vertical" (as one looks up to sky and down to earth) and interior communications between Primordial, Early, and Later Heavens. One does not practice qigong or alchemy to GET qi. Rather one already IS part of nature's infinite qi field, and is just learning to recognize the unconscious communication patterns that are always flowing between one's micro-cosmic (personal) qi field and the impersonal macrocosmic qi field. At its simplest level, all human sensing, thought, speech, feeling, body movement, breathing rhythm, and visualized image are attempts to "speak to" or shape this qi field. Whether you scratch your nose or do higher math, both elicit a response from the qi field. The totality of these shapes, the sum of the conversation between Heaven and Earth that is passing through us, is one's experience of physical reality. Our personalities, our bodies, and even our environment are the moment to moment shape of the fluctuations in this superintelligent qi field. Within the natural physical world, the movement of the qi field is the hidden language by which the intelligence within atoms, molecules, cells, rocks, plants, animals, young children, mountains, oceans, sun, moon, planets and stars communicate and maintain their rhythm and harmony. Everything, without exception, is alive and communicating something by virtue of the physical and energetic shape given to it by Nature's intelligence. The internal alchemist eavesdrops on this conversation within the qi field, and then from a human perspective performs alchemical operations to shape the qi field in order to accelerate the unfolding of life's inherent simplicity, wholeness, and aliveness. All paranormal abilities in humans - ESP, channeling, clairvoyance, etc. are also communications by human body-spirits (jingshen) shaping the qi field, but most are unconscious faculties and thus differ from nei dan. Alchemy is not the unconscious channeling of Nature's intelligence. Rather the alchemist attempts to accelerate the conscious unfoldment of Nature's macro-cosmic intelligence through resonance with the adept's personal micro-cosmos. How does the nei dan adept communicate between heavens, i.e. between Heaven and Earth? It depends on what level of heaven they are communicating with, and the skill level/formula they have achieved in resonating with the qi field. There are many different practices, but all may be categorized as yang practice, yin practice, or wu wei practice. All three practices require the adept interiorize the outer universe within the adept's body. In yang practice the adept uses his yi "mind intent" or "creative imagination," the Later Heaven shen ruling the earth element/spleen/center direction, to actively communicate with or "speak to" the qi field in cooperation with the other four elements/body spirits. This effectively involves the use of projection, guiding or shaping the qi field according to the adept's inner will. The yang methods work by cultivating an ability to move qi in the eight extraordinary channels or by opening a relationship between the yi and the other internal body spirits (jing shen) through the five phases of the creation or control cycles in the body. The guidance of qi should not be confused with western concepts of mental visualization, although there is some overlap. In shaping the qi field the five colors, five tones, internalized bagua shapes (as symbol of eight original forces) or spinning vortices are activated within the adept's personal qi field, or "energy body." The term "actualization" is more accurate than "visualization." Without the adept first activating the movement of qi in her qi channels or dantian (elixir fields), the alchemical operation will not produce the desired results. Visualization of this type will simply produce an empty picture in the practitioner's mind, and little qi. In yin practice the adept "listens" to the qi field, and concentrates on receiving energy patterns or absorbing spiritual qualities from the qi field. This is akin to one's ego will surrendering to one's higher will or a more collective level of the self. In this case the five body spirits or eight extraordinary channels act as internal antennae for decoding the qi wave patterns being communicated from the outer qi field to the adept. Any given alchemical meditative operation may involve both yin and yang practices, the choice depending on the season, time of day, the situation in the individual life of the adept. The type of alchemical method may reflect the cycle of events in the life of the greater cosmos, its geomantic and astrological forces. The wu wei practice involves the adept cultivating a shift from outer will to inner will, from the struggle amongst the desires of various body spirits (jing shen) to the unity of the original spirit (yuan shen). Wu wei is translated variously as "spontaneous action" or "effortless non-action," but the practical accomplishment of this requires the cultivation of yuan qi, which is the superconductive non-resistant energy of Primordial Heaven. Essentially wu wei is the fruit of mastering yin and yang practices; the adept evolves to a level of conscious and simultaneous sending and receiving qi, i.e. two way communication between the adept and the mind of nature. Wu wei requires a state of total trust between the adept and the Dao; their yi, or will, is gradually aligned as the adept develops trust in the life-force and his ability to manage it. The adept grows to receive the full power of the dao needed in any given moment, and the dao trusts the adept to create or express its reality in harmony with the life force. This cooperation is made possible because the communications network of qi channels and spirit relations inside a human being are essentially the same patterns as those inside a planetary being or galactic being, the main difference being in scale and specific qualities embodied. This ancient daoist idea is expressed in modern theory by fractals repeating themselves on vastly different scales, i.e. from starscape to mountain shape to internal landscape. The adept is not giving up all individual will to an outside agency that is more spiritually powerful and more intelligent. Rather the adept learns from the macrocosm of Nature how the life-force behaves, and internalizes that within their personal process. Likewise, human babies learn from their parents how to navigate this reality, but then ideally use that learning to create a life according to their own nature. All communications between shen, qi, and jing are ultimately dissolved into the adept's interior cauldron of pre-natal emptiness. Thus the details of the often elaborate alchemical process are frequently abbreviated to simply "jing-qi-shen-wu" — [ed. note: essence-energy-consciousness–undifferentiated void]. The more one practices nei dan, the greater one's facility with the qi field becomes, and the more the qi field of Nature recognizes one as a sensitive and available location within the physical plane for expressing itself. The ultimate act of communication with the mind of the Dao is to crystallize the yuan qi into conscious form on earth, known as the Immortal body, discussed next in The Cauldron as Portal for Communicating with Original Qi. 1. One Cloud's Nine Tao Alchemy Formulas To Cultivate the True Immortal Self, " by Michael Winn. 2. Nei Dan Formulas as Stages of Cultivating Original Qi, by Michael Winn. 3. Further information on the "Three Open Channels" of Reality, Peace, and Spirits see The Book of Balance and Harmony: A Taoist Handbook, by Daochun Li, introduction and translation by Thomas Cleary. Shambala Publications, 2003. 4. 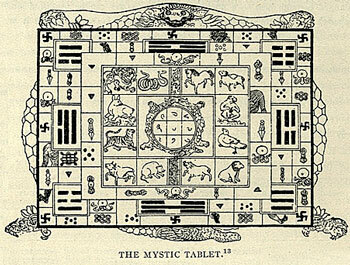 Magic Numbers, Planetary Tones and the Body: The Evolution of Daoist Inner Alchemy into Modern Sacred Science, by Michael Winn.